It’s Kentucky Derby weekend and the first Saturday in May, with the Churchill Downs classic headlining all of racing, is jam-packed with standardbred action, too, as the Grand Circuit for 2012 is officially launched in New Jersey. At Freehold in the afternoon, the Hambletonian Trail launched the soph-colt trotters in the Dexter Cup. On Friday, May 4, two $80,000 divisions of the Lady Suffolk for the soph-filly trotters highlight the card. You can read previews for both of those races at the exclusive Hambletonian Trail blog and check the result stories at the Hambletonian Society’s web site as we shuttle the stakes stories to keep you more informed than any other place on the Internet about wagering on the top races leading to the first Saturday in August. 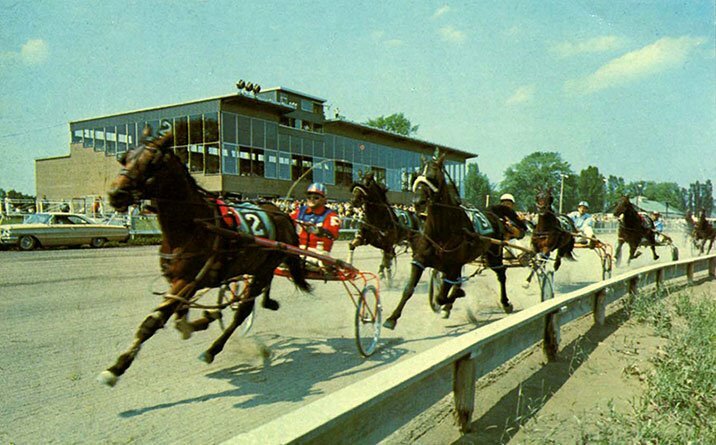 Also this weekend, the “Simpson” Grand Circuit events go to the Meadowlands as the Championship Meet begins. Soph filly pacers go on May 4 and the glamour-boy pacers go on May 5. The Graduate Series brings the stalwart pacing horses from their “Levy” marathon at Yonkers to the Meadowlands on Saturday, while the older trotters go in the A.J. Cutler Prep on Friday. At Cal-Expo, TwinSpires-Cal-Expo’s exclusive no-takeout Pick 4 is one more reason the weekend is great. Remember, it is now on Friday nights. Friday night at the Meadowlands features the prep for the A.J. Cutler Memorial, featuring the elder trotting division. Many familiar names return for the 2012 edition, including Looking Hanover and Hot Shot Blue Chip. It looks as though the Robert Key entry of Ice Machine and Winning Mister, along with late-bloomer Big Rigs, will be favored by the public. We are going to take our chances with Dig For Dollars. The Canadian invader was third best to Elitloppet-eligible Windsong Geant and San Pail. This guy made a big step up from Flamboro when taking on the big guys at Woodbine. He won there in an Open and should do just fine at the Big M.
Another contender is Magnum Kosmos, who was a top trotter on the Hambletonian trail last year. He’s going to have to step up from a non-winners of $13,000 over at Pocono to go against the big guys. This horse is known for making breaks, but has great gate speed. If he gets the top, it will be hard to get him off of it. The co-feature on the Friday card is the $53,360 Simpson for three-year-old filly pacers. This Grand Circuit event was at Tioga Downs last year and comes to New Jersey since the Meadowlands was purchased by Vernon-Tioga boss Jeff Gural. It was divided into two divisions. The first division features Pirouette Hanover, who tussled well with the likes of Handsoffmycookie and Economy Terror. We are going to take a shot against her with a Linda Toscano trainee that is making her second start. Day Blue Chip made her first start in a Maiden at Pocono, where she won by 8 lengths in 1:54.1. She makes her three-year-old debut and is coming off of keen qualifiers. Although she may be well supported, Jaime Sue is a horse to watch. She has always loved the Meadowlands. The Tender Loving Care champ tried to score up north in the Blossom, where two first-over trips ruined her chances to make the final. She won a conditioned event before she shipped back down into the Mark Ford barn. The second division is wide open. Gottaseeaboutagirl may be the favorite as she returns from a failed effort in the Weiss Late Closing series. The Night Styles champion is known for her late-closing kick. Although she is lightly raced, Kiss Don’t Bite has gate speed. If she can go a fast pace, Gottaseeaboutagirl won’t be able to close as well. Saturday night is just for the boys at the Meadowlands. Kicking off the stakes action is the $46,374 Simpson for glamour-boy pacers. The buzz horse has been Mel Mara, who trainer Tony Alagna said “could be anything. Along with Mel Mara, comes the Holloway entry of Social Network and Ideal Champ. These three will be the likely betting interests. Bolt The Duer ships in from Pocono after going 1:52.1 in a qualifier. This horse beat Breeders Crown-champion Sweet Lou at Lexington in the International Stallion Series at two. He not only be tough in the Simpson, he could be a major player throughout the stakes season. Up next in the card is the Graduate elimination. From the half-mile antics of the long Levy series and top FFA action in Canada come Golden Receiver and Foiled Again, the likely favorites. Rockincam and Meirs Hanover may be able to do the job of defeating the classy duo. Rockincam won his last two starts very convincingly as the favorite. He draws the rail again and has a great shot. Meirs Hanover mainly stayed in western Pennsylvania for the winter, dominating in Preferred company at the Meadows. Meirs Hanover and Rockincam paced one-two in their last two starts, with their most recent being the closest finish, with only a nose between them them. They will fight until the wire here along with some mighty steeds. The May 4 no-takeout Pick 4 at Cal-Expo is, again, the last four races of the program, from 11 through 14. Let’s look at some likely contenders that could make it a worthy hit. (6) Red Star Popeye was impressive finishing third while tampering a great deal with the outer route. Let’s single him and go for the throat right from the start. (4) Preciosita is sitting on a big mile. Last week she took the long way around and got the show at 8-1. She is edgy as well as our first-leg candidate and probably will offer as much value. (7) Jane The Brain may be overlooked in this field and could play a major role after a disappointing mile as a well-supported contender. Forgiving her that mile may be the key to using her here, most likely at a higher rate. (2) Village Benjamin may be on a streak now and win for us again here. Vallandingham has him sharp now. (6) King Carver broke and had no chance to recover and participate. The race before that made us use him last week and we should add him again here. There looks like a lot of activity can go on in the final leg but (2) Max’s Illusion may be the.one to close the deal. He placed with convincing strength last week and is in the perfect spot to strike.